What if you learned that the everyday act of diapering could promote and support your baby’s health and development? 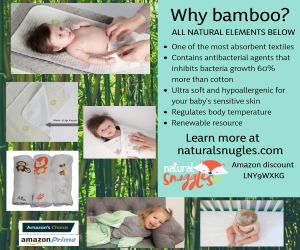 That the routine actions of moving, touching and caring for your baby and their skin during a diaper change could create trust, connection and a surge of positive emotions that support baby’s overall health and wellness? That idea alone would turn a rote task into a mini masterpiece! Diapering can be enjoyed and beneficial for baby—not just endured—say the experts of the Huggies® Nurse Advisory Council. Their new program, Every Change Matters: A Guide to Developmental Diapering Care, explores the research regarding how the very simple act of diapering provides healthful and developmental opportunities for bonding, attachment, closeness, stress reduction and comfort between you and your infant. Before you ever change your baby’s first diaper, you’ll likely spend months preparing to do so. Maybe you’ll put a changing table in baby’s nursery, or act on the advice of an experienced mom and set up “diapering stations” with supplies all around your home. You’re aiming for ease and convenience—right? You’ll likely change 10,000 diapers before baby transitions to a potty. Isn’t it nice to know you have the opportunity to also help baby grow stronger and healthier during these times? During baby’s first days, you’ll change up to 12 diapers a day—that’s up to 12 opportunities to hug your baby close to you, connect, bond and form fun rituals together that turn the ordinary task of diapering into something extraordinary. Parenting can be stressful and overwhelming—especially when you’re not getting all of the sleep you need. You may feel tempted to rush through daily care tasks to get on to other activities with baby. In your hurry, you might miss out on these little moments to bond with your baby! Diapering is the perfect time to practice mindfulness in your care habits. Mindfulness means being completely engaged in the present moment. It’s taking your life off autopilot; paying attention to each and every second with your baby; and becoming aware of baby’s moods, movements, expressions and most importantly, baby’s cues. Like any good habit, it takes practice. Create a sensory symphony at each diaper change with your soft voice, gentle touch, slow and careful movements, and with a sing-song voice sweetly talk or sing to baby. Keeping one hand on baby during diapering is a safety measure but also becomes a reassuring touch, especially if baby should startle or move suddenly. Smile at baby. Create calm and happiness by gazing into baby’s eyes—spend a few moments making that emotional connection. Babies love to look at and interact with others, and research tells us that they quickly recognize and enjoy seeing family members, especially their parents. Regularly hug, touch and love your baby—every diaper change can begin and end with a hug! Research proves the power of touch is linked to positive feelings and uplifting emotions for both you and your baby. When you’re relaxed and engaged, baby feels connected—your bond—through your touch and attention. Your calm demeanor during diapering reassures and calms baby, helping them feel comfortable with the movements, cleansing, diapering and dressing that go into changing baby. Your focused attention and touch are what baby needs to flourish and thrive—so don’t forget to give your baby another hug when diapering time is over! Being mindful during diaper time instills a sense of calm into your life as you remind yourself that parenthood is a gift. You create a calm environment when you approach everyday routines in a relaxed manner. In our harried and hurried world, take the time to be good to yourself and your baby by approaching diapering in a mindful, caring way. Changing 10,000 diapers may feel like an impossible task at first, but when every diaper change is approached with the physical and emotional desire to connect and bond with baby, it becomes another way you’re supporting baby’s best health and development. BIO: Charlotte Wool, PhD, RN, is a nurse educator and an expert adviser to Healthy Mom&Baby. Development of this article was supported with funding from Huggies®. Touch is one of the first senses to develop in babies, and it remains perhaps the most emotionally potent sense throughout our lives.